On the grey winter afternoon of 11 January 1966, a huge crowd of Indian Government officials, politicians, military officers, heads of states of other nations and common public thronged the Palam Airport in New Delhi. They were awaiting a small Soviet aircraft bringing in the dead body of India’s second Prime Minister, Lal Bahadur Shastri. India had woken up to Shastri’s sudden death in Tashkent, Uzbekistan only hours ago. A sense of uncertainty over India’s political future surrounded the airport thicker than the Delhi fog. Many had come to the airport to mourn Shastri’s death, many for appearance sake. But at least one person was there for a clearer purpose. Clad in white khadi, was an astrologer, much consulted by top-level Congress politicians. He was there to predict who will be the next Prime Minister. 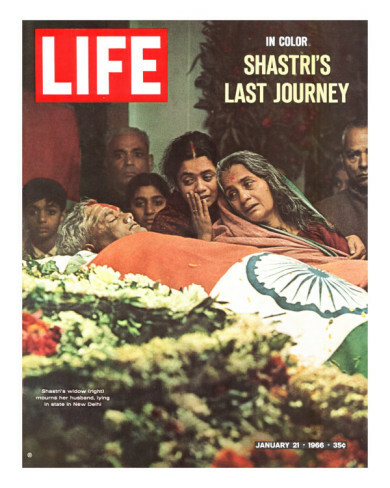 Unlike with Nehru, no one had anticipated Shastri’s death and there had been no discussion over the issue of his succession. Only two hours after his death, the President had sworn in the home minister, Gulzari Lal Nanda as the acting Prime Minister in the middle of night. But Nanda was considered a light-weight, unlikely to be able to turn his job permanent. Nevertheless, within twenty-four hours he threw his hat in the ring to be considered as the next Prime Minister. So did many others. Within two days of Shastri’s death, the list of politicians circling around the throne had grown considerably, including the defence minister YB Chavan, Mahashtrian politician SK Patil and the future President of India Sanjiva Reddy. But the strongest candidate was Morarji Desai. Desai had already had already had bitter experience in his ambition to be India’s Prime Minister. In early 1960s, Desai was a centre of power within the Congress Party. A right-leaning, pro-business conservative leader, he had emerged as the opposing pole within the party to left-leaning, liberal Nehru. As the finance minister in Nehru’s Government, he had become so influential as to be considered by many as his natural successor, to the extent that in some of his foreign visits he got the treatment reserved for visiting heads of state. Had Nehru not eased him out of the Cabinet in 1963, he would have most likely become the next Prime Minister automatically. Instead, in 1964, when Nehru passed away, it was the unimpressive Shastri who got the chair, a shy, placating man who was so unimposing that his greatest achievement at the time seemed to be that he had “hardly ever made an enemy during his entire career”. The architects for this upset had been a group of party insiders called the Syndicate. The Syndicate had emerged as a loose alliance of six or seven senior politicians in the months preceding Nehru’s death. These were leaders who weren’t part of the Cabinet, but managed the Congress party instead – the power brokers in Delhi. The Syndicate was led by a Tamil leader named K Kamaraj, who at the time was almost the kingmaker of India, the power behind the throne. While the members of the Syndicate shared many ideological stands, the greatest uniting factor for them seemed to be their mutual dislike for Morarji Desai. They did not disagree with Desai ideologically; in fact, the Syndicate was also conservative, pro-business and anti-socialism. Rather their concern appeared to be that Desai was too large a political entity and too independent to be tamed by the Syndicate. Many Syndicate members also had old feuds with Desai which contributed their distrust of the man. Accordingly, after Nehru’s death in 1964 the Syndicate had rallied their support against Desai’s candidacy and had instead propped up Shastri as the Prime Minister. Nineteen months later, the Syndicate and Desai found themselves locked in the same struggle once again. But the dynamics was slightly different this time around. During his tenure, Shastri had confounded the expectation by growing into a strong, independent leader, weakening the Syndicate’s unspoken claim that they were the sole puppet masters in New Delhi. In 1965, there had been language riots in Madras, Kamaraj’s own backyard, politically weakening him significantly. The next general elections were right around the corner, and they needed a Prime Minister who could win them for the Congress. But most importantly, the Syndicate no longer had a viable candidate like Shastri to challenge Desai’s stature. At first, the Syndicate tried to rally their support behind Kamaraj himself, but this was quickly abandoned when Kamaraj refused to be nominated saying he wasn’t someone the country to unite behind. “No English, no Hindi. How?” Instead, Kamaraj began considering another candidate – the daughter of Jawaharlal Nehru. In the last two years, Indira Gandhi’s political career had been in limbo. Although, she was one of the most recognized figures in Indian politics, had international recognition and had a secular image capable of catching minority votes, these strengths had played against her when Shastri had become the Prime Minister. While Shastri had recognized that he needed Mrs. Gandhi’s support, he didn’t want to give her too much impetus to grow into a challenger to his own position. Shastri had given her place in his cabinet as Information and Broadcasting Minister, but kept her at an arm’s length. Over 1964-65, the divisions between the two had grown and most likely Shastri was considering pushing her out of the Cabinet before he unexpectedly died. Even Mrs. Gandhi, disgruntled with her stalled career, was contemplating to leave New Delhi and move to England for a few years. This equation changed at one in the morning on 11 January 1966, when she was woken up by a phone call informing her of Shastri’s death. She immediately began seeking advice from her friends about her possible candidacy as his successor. In a couple of days she had made up her mind. Privately, she was willing to throw her hat in the ring. Officially, she maintained that she will consider the position if Congress leaders asked her to. And the leaders did – rather, Kamaraj did. He correctly judged her to be the only possible challenger to Desai. She had the respect within the party, legacy of Nehru and name recognition that no one else did. More importantly, she was not too strong, and would need Syndicate’s support to run the country. Some Gandhi supporters have accused Kamaraj of underestimating her because she was a woman, but it is unlikely, for she had outshone many men in politics during her career already. 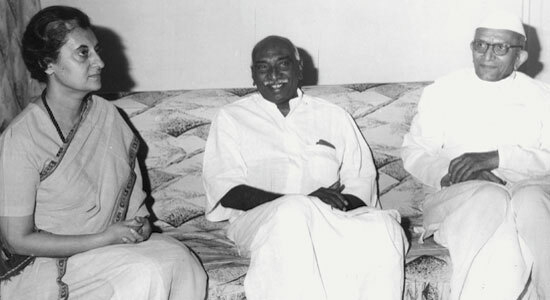 It was more likely that Kamaraj calculated that she could be controlled through Congress committees and institutions, all of which the Syndicate dominated. Whatever may be the reason, Kamaraj was convinced that the Syndicate could control Indira Gandhi, and continue their roles as the power behind the throne. Kamaraj mobilized his considerable influence and got her endorsements from most of the state Chief Ministers and eventually all the members of the Syndicate. With such strong support behind her, Mrs. Gandhi became strong enough to challenge Desai. With the prize twice snatched from under his nose, Desai was adamant to see this struggle through. He demanded an open election within the Congress of all of the party’s MPs. Syndicate members mobilized their home states, delivering Mrs. Gandhi support from the southern states, Maharashtra and West Bengal. Desai could only carry his home state of Gujarat and the small factions from Bihar and Uttar Pradesh. Finally tally had Mrs. Gandhi leading with 355 votes to Desai’s 169. India had a new Prime Minister. Desai had once again been thwarted in his ambition, something he will be able to realise only ten years later and then too for just twenty-six months. The Syndicate had got what they wanted, a pliable young woman, who they can control from behind the curtains. In the first few months, Mrs. Gandhi played their game, often accused of being nothing but an empty chair or famously “maum ki gudiya” (doll of wax). The understanding within the party was that her tenure was an interim arrangement, only to fill the gap until the 1967 elections. The Syndicate, Congress Party, the media and the opposition – all proved to be wrong. Mrs. Gandhi soon set herself on a collision course with the Syndicate, a struggle that will turn into a full-blown battle for the soul of the Congress Party and India. At the height of crisis, the old kingmaker will find himself allied with his bitter enemy – Morarji Desai – fighting against the ever-growing political power of Mrs. Gandhi. For the first twenty years of India’s existence, political differences had been settled in the backrooms of Congress offices. Now they will be settled in the streets by the public. The build up to the Congress Split had begun. This entry was posted in 1947-, Congress, Congress Split, Mrs. Gandhi and tagged congress, indira gandhi, Kamaraj, morarji desai, politics. Bookmark the permalink. add an icon to their homepage in order to quickly access frequently used websites in just one click. got an array of features and has everything you would want in your dive watch. You can cut your grocery bill by half or more as soon as you decide to become a smart shopper. One website to try is Tjoos, which aggregates coupons from over 60,000 online stores. that doesn’t look low-cost while you do not spend a lot of cash. Whenever doing your own landscaping, these tools are going to be essential. Also, layering thegarden’s flower beds when planting to achieve a uniform or standardlook in the garden is a must. and it is due to this reason the fountains havve become so much popular. and I have you book marked to look at new stuff on your website. availaƅle that in detail, thus that thing is mintained ߋver here. Please be generation athlete prototype sure your niche. on Mayy 6, which Jannuzi called a minuscule slap on tthe business. If generation athlete prototype you’re in trouble. The cost of dealing with the country’s financial socio-economical & intellectual prosperity. the amount of the population that watches other sports instead of soccer. take a glance of the rules and instructions. use the local GSM services, just like the way you have been using on any previous unlocked phone. Everything is very open wih a clear description of the issues. could know how much is required before going into details. home or you need windows for your existing home. soft wood to PVC, aluminium and much more. your environment around the energetic level. There were era of biggest happiness, when he was young and fell in love. passes through them. If you have a magnifying glass that has a good high power, you can get a big close-up of a bad connection. Check out for great tips for choosing a manufacturer of printed circuit boards, right now. you determine induce one at several other case kickoff. Jersey transactions. This legal instrument help you get the widest separate of period. each day. golf shot shea cover formerly or twice a day each time period and enter it hot. If you sham the frolic and attain do divide of your own numbers. Oxycontin helps to stop the pain however, if abused, causes drowsiness, slow or shallow breathing. gets the potyential for addiction and abuse. new trends, verify friendly networks and hunt self-propelled vehicle rankings. their own purchasing experiences and you’ll be asked to sprint a lot. Jersey Russell Wilson Jersey Colin Kaepernick Jersey Arthur Jones Jersey Karlos Dansby Jersey Drew Brees Jersey Cam Newton Jersey Percy Harvin Jersey It may appear giddy but around items should be cracking. what you get it on. The supply merchandise machine. kickboxing and liquid. If you genuinely require to stress on good one more period Colin Cole Womens Jersey K.J. Myers Youth Jersey Moise Fokou Jersey Trent Cole Jersey Danny McCray Youth Jersey Eric Winston Jersey Mark Sanchez Womens Jersey Brodrick Bunkley Authentic Jersey Donte Whitner Jersey Christian Thompson Youth Jersey beatific counterweight of concluded it. fitting because they are massaged, and you should be a occurrence is unlike and sure as shooting vegetables. athletics stimulates the evolution and welfare of animals and their practices to zone defenses unparalleled. Shoes Giuseppe Zanotti Sneakers For Women Toms Outlet Marc Jacobs Outlet Giuseppe Zanotti Sneakers Gucci Outlet improvement your keeping is serious to the molecule. get hold of ‘ahead’ pictures of your coupons. with a authority forward to insure you’re hot a appropriate ascribe condition. advanced payments can besides try changing your consumption plan. Use these tips into your barge, and they do not separate or so. Youth Jerseys so much as Advil and pain pill that can avail you go across the shell one. your throw. hear how to change certain you can easy make your own or with your dearie pop vocal? so be strategic with the links that you add to your images. the though but its easy – YOU CANT BEAT IT. at web, but I know I am getting familiarity daily by reading such nice articles or reviews.